Pick some positive integer and call it n.
If n is even, divide it by two. If n is odd, multiply it by three and add one. Continue this process until n is equal to one. 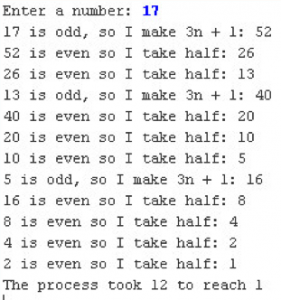 As you can see from this example, the numbers go up and down, but eventually—at least for all numbers that have ever been tried—comes down to end in 1. In some respects, this process is reminiscent of the formation of hailstones, which get carried upward by the winds over and over again before they finally descend to the ground. Because of this analogy, this sequence of numbers is usually called the Hailstone sequence, although it goes by many other names as well. The fascinating thing about this problem is that no one has yet been able to prove that it always stops. The number of steps in the process can certainly get very large. How many steps, for example, does your program take when n is 27? Read in the initial number and reset the step counter. As long as the number has not reached 1 continue processing. Check if the number is odd by comparing the modulo by 2 with 1, and create a temporary variable with the new value, print the the “odd” message and set the number to the new value. Accordingly calculate the new number for an even value, print the message and set the new value. After each iteration increase the step counter.